From summer to fall — quickly! The seasonal tide has turned in San Francisco, and there is nothing I like more than a pot of soup on a rainy Sunday evening in autumn. When I develop recipes, I tend to look for base flavors that can accomodate experimentation. 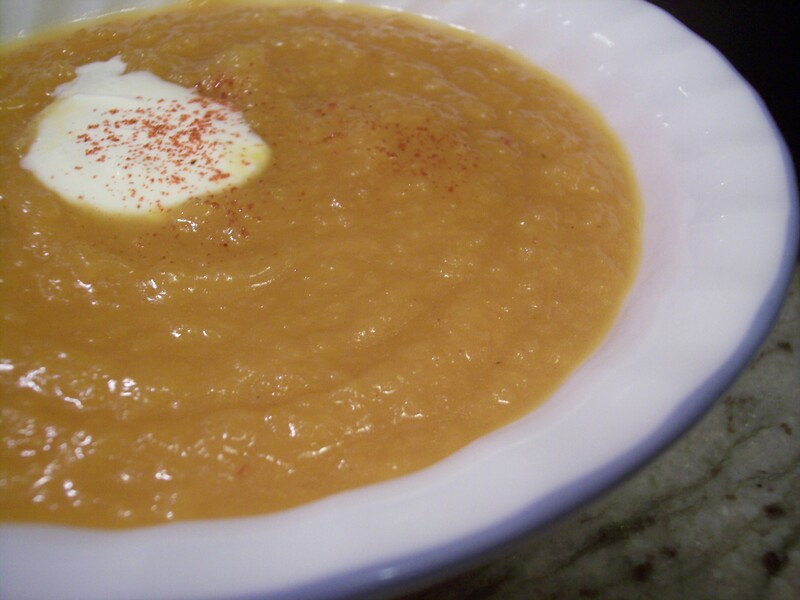 For soups, butternut squash is the perfect blank canvas to absorb a variety of different flavors. For this soup in particular, I combine the sweet/savory of the squash with the spice of the chipotle and richness of the adobo sauce. A bowl of this soup is at once sweet, hearty, savory and spicy. Prepare squash, toss with olive oil and bake until soft, about 30 minutes. Transfer squash to a sauce pan and add broth, salt, chipotle pepper, adobo sauce and brown sugar. Simmer over medium-high heat until the soup has reduced by a quarter. Garnish with a dollop of crema or crème fraiche. Of course! Sooner than later, I hope!